Adam had a broken tooth for many years and was motivated to have it fixed when he was preparing to audition for American Idol. An all ceramic crown was used to replace the broken tooth. His smile tells all. Rachel didn't like the spaces between her front teeth or how small they looked. Bonding helped reshape her teeth. We were able to preserve her good tooth structure and still improve her smile. This patient had a Meth addiction, and one of the problems associated with this is rampant tooth decay. The decay was repaired with filling material and his appearance was greatly improved. Sometimes teeth appear darker because of stains that have built up over time. This patient's teeth had not been cleaned in a few years but after a professional cleaning she had a bright new smile. Cathy had old fractured and mismatched dental work from her previous dentists. 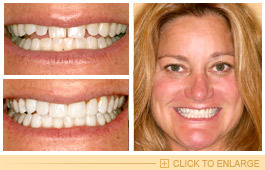 We placed eight ceramic crowns to give a beautiful, more natural appearance to her upper teeth. Bryan finally overcame his addiction to meth and had an upcoming job interview. After a proper cleaning, we were able to clean up the massive decay and place temporary bonding to improve his appearance. Clay was not happy with his small teeth and the spaces between them. Bonding was placed to close these spaces and Clay was thrilled with the way his teeth looked afterwards. Joe was born without his two lower front teeth. 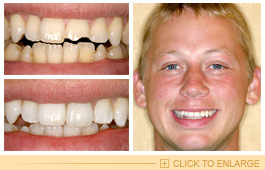 He wanted a simple fix that was not too costly to try to replace the missing teeth. The spaces were closed and bonding was added in the shape of a tooth.